My thinking is impatient and mostly critical as I sift through research each week. I’m sure my “get to the point” personality frustrates my co-workers and I’m sure at times my beautiful wife. It’s a personality flaw, I know; but hey, I’m just not sure any amount of therapy can help. Over a short period of time you can spend more money than what you earn. That’s because we have debt. So we have debt cycles. There are two major debt cycles. 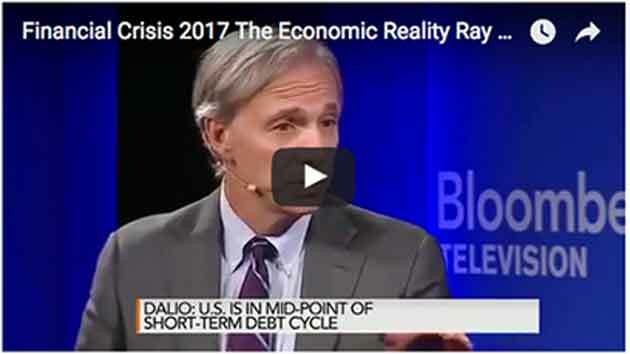 There is a short-term debt cycle which we are used to (it’s called the business cycle). We have recession and the Fed eases. What they do is reduce interest rates and as a result, money and credit goes out into the system. And then there is a long-term debt cycle because these cycles add up. In a long-term debt cycle, imagine you start off with no debt. Think of low debt-GDP ratios. Say you’re earning $100,000 a year and you have no debt. You borrow $10,000 so you can spend $110,000. Your spending is somebody else’s income. They are earning more so they can spend more. And it becomes self-reinforcing until you get to the point where debts rise too high relative to the income (like a balance sheet, at some point you can’t borrow anymore because you owe too much relative to what you can make, your income). Central banks, all central banks, are in the business of helping this process go along. They lower interest rates, and lower again until rates hit 0% and we then come to a dilemma. We reach an end of monetary policy as we traditionally have it and as a result, you can’t keep that cycle going. The United States is in the mid-point of its short-term debt cycle so as a result central banks are talking about whether we should tighten or not. That’s what central banks do in the middle of the short-term cycle and we are near the end of a long-term debt cycle. And the downturn should be particularly concerning because we don’t have the same return potential with asset prices richly priced, so each series of QE cannot provide the same bump. You reach a point where QE is simply pushing on a string. Ray responded, “No, we are not there yet, but we are close. Some countries are there. Europe is there. What are you going to buy in a negative interest rate world? Oddly, rising concern about the risks of financial excess is good news. It reflects the arrival of the first synchronised global economic upswing since 2010. GDP growth in the quarter ending in June was the most rapid since then, according to JPMorgan Chase, thanks to stronger-than-expected activity in China, Japan and Europe (Britain was a notable exception). Any relief, however, is mixed with anxiety that the excesses which led to the crisis of 2007-08 are again pervasive. Policymakers have helped support the economy over the past decade. But by keeping interest rates low, they have also spurred investors to take extra risks in search of larger returns. 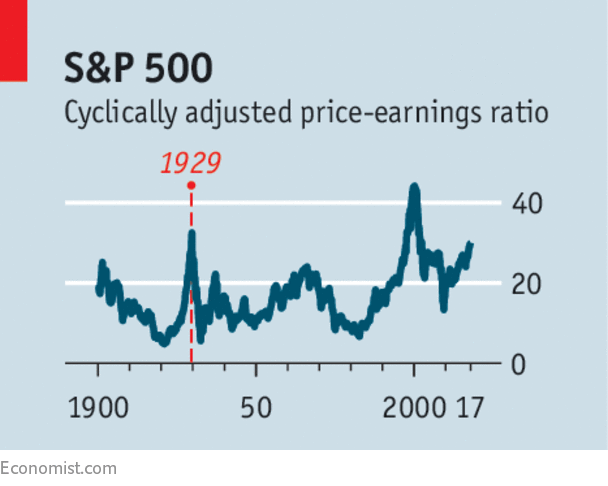 The American stockmarket is on a cyclically adjusted price-earnings ratio of 30—a level surpassed only in 1929 and the late 1990s. Investors are rushing to buy government debt from risky countries. Argentina has defaulted on its debts six times in the past century, but still easily found buyers for a 100-year bond in June. Earlier this month buyers snapped up Iraq’s first independent bond issue for more than a decade. The tension between growth and stability is most obvious in China. The IMF this month simultaneously raised its growth forecasts and warned that the country was gorging itself on debt, which jumped from 150% of GDP in 2007 to 280% in 2016. Since the start of this year, the People’s Bank of China has restricted the supply of short-term liquidity to banks. Regulators have also ordered them to account for loans hidden off their balance-sheets. So far, so good: funding costs have risen and overall credit growth has slowed even as nominal growth has rebounded. But the economy has recently started to lose momentum. Will China continue efforts to constrain credit even when growth dips below official targets? The fear is that it will revert to type and let credit surge again. Concerns about financial fragility are of a very different kind in Europe, where a recovery is gaining strength. Since December, when the European Central Bank lowered its target for asset purchases, to €60bn ($70bn) a month, there has been speculation that the ECB’s programme of quantitative easing (QE, the creation of money to buy assets) must wind down soon. But the bank is nervous about a repeat of the “taper tantrum” of 2013, when markets were spooked by signals from the Fed that it would be stopping QE. A hurried withdrawal of QE might cause a sudden rise in bond yields as bubbly assets are repriced. That could hurt countries, such as Italy, with big public-debt burdens. The Federal Reserve sits somewhere between China and Europe. The American economy has been expanding for years; only twice in its history has it grown for more consecutive quarters. Its financial system looks robust. But here, too, queasiness about share prices and the lengths to which investors will go to buy bonds with decent yields has crept into the Fed’s deliberations. As the crisis of 2007-08 fades from memory, the Fed is worrying about the efforts of the Trump administration to loosen the shackles that bind the banks. Stanley Fischer, its vice-chairman, has opposed proposals from the Treasury that “stress tests” of big banks should be softer. It is right that central banks should be vigilant about threats to financial stability. But the Fed should not yet put concerns about risk-taking above the immediate demands of the economy. American banks are well-capitalised; and there is a decent case for simplifying some post-crisis regulations, particularly those that bind America’s smaller lenders. As for the euro zone, its recovery is still recent and continues to need support; the ECB should not be withdrawing stimulus abruptly in any case. For China the real test lies ahead, perhaps as early as next year. Tensions between growth and stability will become more acute as time goes on. But as the central bankers descend on Wyoming, it is too soon for them to stop worrying about the health of the world economy. But electrification has thrown the car industry into turmoil. Its best brands are founded on their engineering heritage—especially in Germany. Compared with existing vehicles, electric cars are much simpler and have fewer parts; they are more like computers on wheels. That means they need fewer people to assemble them and fewer subsidiary systems from specialist suppliers. Carworkers at factories that do not make electric cars are worried that they could be for the chop. 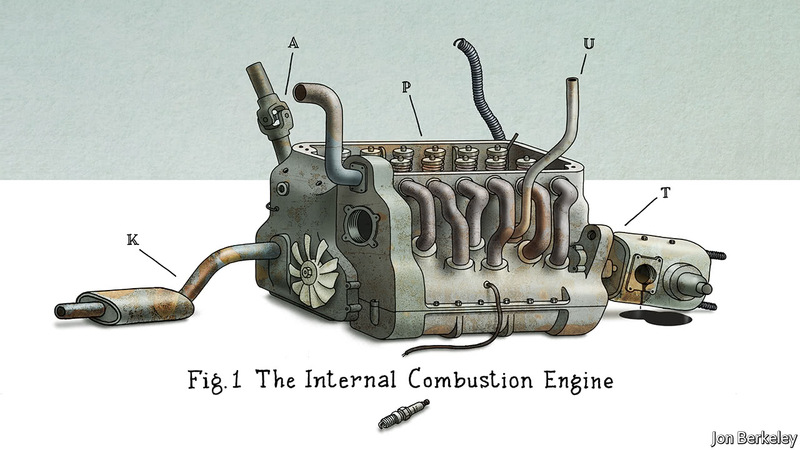 With less to go wrong, the market for maintenance and spare parts will shrink. And then there is oil. Roughly two-thirds of oil consumption in America is on the roads, and a fair amount of the rest uses up the by-products of refining crude oil to make petrol and diesel. The oil industry is divided about when to expect peak demand; Royal Dutch Shell says that it could be little more than a decade away. The prospect will weigh on prices long before then. Because nobody wants to be left with useless oil in the ground, there will be a dearth of new investment, especially in new, high-cost areas such as the Arctic. By contrast, producers such as Saudi Arabia, with vast reserves that can be tapped cheaply, will be under pressure to get pumping before it is too late: the Middle East will still matter, but a lot less than it did. Although there will still be a market for natural gas, which will help generate power for all those electric cars, volatile oil prices will strain countries that depend on hydrocarbon revenues to fill the national coffers. When volumes fall, the adjustment will be fraught, particularly where the struggle for power has long been about controlling oil wealth. In countries such as Angola and Nigeria where oil has often been a curse, the diffusion of economic clout may bring immense benefits. The concept of phyles originated with the sci-fi writer Neal Stephenson, in his seminal book The Diamond Age. I’ve always been a big fan of quality science fiction. I’m not sure why it’s true, but there’s no question sci-fi has been a vastly better predictor of both social and technological trends than absolutely anything else. The book, set mostly in China in the near-term future, posits that while states still exist, they’ve been overwhelmed in importance by the formation of phyles. Phyles are groups of people that get together with others, bound by whatever is important to them. Maybe it will be their race, religion, or culture. Maybe their occupation or hobby. Maybe their world view or what they want to accomplish in life. Maybe it’s a fairly short-term objective. There are thousands—millions—of possibilities. The key is that a phyle might provide much more than a fraternal or beneficial organization (like Rotary or Lions) does. I take the concept quite seriously in my daily life. It’s one reason I don’t believe in organized charity. Phyles might provide insurance services very effectively, since a like-minded group—held together by peer pressure and social approbation—eliminates a lot of moral risk. It might very well offer protection services; a criminal might readily take out a citizen “protected” by a state, but they’ll think twice before attacking members of the Mafia. People are social. They’ll inevitably organize themselves into groups for all the reasons you can imagine. In the past, technology only allowed people to organize themselves by geography—they had to be in the same area. That’s been changing, especially over the last century, with the emergence of the train, the car, and especially the airplane. The same with communication. The telephone and television were huge leaps, but the Internet is the catalytic breakthrough. It’s now possible for people to reach out all over the world to find others that are their actual countrymen, not just some moron that shares a piece of government ID with them. As things develop, people will find out—or create places—where their loyalties lie. The nation-state has mostly been an inefficient, counterproductive, and expensive nuisance; it’s rapidly becoming completely insufferable. And dangerous; the people living off the state (which is to say acting as parasites upon their “fellow citizens”) are going to resist having their rice bowls broken. Undoubtedly they’ll use the coercive powers of the state to try to maintain the status quo. The military and the police (whose loyalties are first to their coworkers, then to their employer, and only then to those whom they’re supposed to “serve and protect”) will be out in force wearing riot gear. If the last major change in social structure was catalyzed by the printing press, it’s pretty easy to see how the Internet serves that function today. But what will facilitate it, the way gunpowder did? My bet is on some type of nanotechnology. I’ve long been a fan of nanotech as a world changer. Technology has always been the friend of freedom and the common man. Sure, the powers of suppression usually get first access to it and always try to monopolize it and use it to keep the “masses” under control, but in the end the cat always gets out of the bag. Even though the state is using an intimidating variety of technologies to keep its subjects under control, technology is evolving much faster and spreading much more broadly, to the benefit of people in general. The end of the state will be precipitated by the Nanotech Revolution. In the years to come, nanotech will, in many ways, be an analog of gunpowder. But thousands of times more potent. It will do a number of things to totally overturn the current world social order. It will, among many other things, show that (at a minimum) the state no longer serves a useful purpose. And will act as the means to facilitate treason… simply because it’s logical, if nothing else. But I’m jumping just slightly ahead of the story. Nanotech is going to become the major force in the world over the next generation. But you’re not going to have to wait nearly that long for all this stuff to start happening. Let me draw your attention to two important things that are just starting to happen, right now, that are going to lead to a New World Order. But not at all like the one envisioned by Bush and Kissinger. I’m not going to spend a lot of time on this. If you’ve been reading our publications for any length of time and don’t think we’re in for something unprecedented, then we haven’t been nearly as clear—and alarmist—as we meant to be. Economic collapse doesn’t mean the world is going to come to an end; it just means there’s going to be a major change in who owns what and how things are produced and consumed. Our main focus is to suggest investments that should not only weather the building hurricane but allow you to profit from it. The purpose of articles like this one is to try to put all that in context. One thing that’s going to militate towards the creation of phyles is the breakdown of the ability of governments to provide the services that people expect from them. At the same time that they’re extracting hugely more in taxes, they’ll be beset by inflation, economic depression, financial chaos, and regulatory havoc. People will increasingly realize the state isn’t a cornucopia that can solve their problems but is, in fact, actually the main cause of their problems. They’ll start withdrawing loyalty from it. People will start organizing themselves into incipient phyles (although they probably won’t call them that), using the Internet. The governments of the world will increasingly clamp down on the Net, recognizing it for the subversive medium that it is, seeing that it’s defrocking their game. Among other things, economic distress usually leads to military action, as governments try to find an outsider to blame for their problems. The tendency is compounded by the perversely wrong-headed notion that a war can somehow cure a depression. This time around, I expect military events will play a significant part in the sea change—just as they did during the agricultural and industrial revolutions. Like any bureaucracy, the military is completely predictable and so is again fighting the last war. Spending $400 million on a single F-22, $2 billion on a single B-2, and many billions on a single aircraft carrier is simply crazy. These technically amusing toys would have been helpful for fighting the armed forces of another nation-state—like those of the USSR, but those largely disappeared decades ago. In today’s world, with a near total shift to unconventional warfare, they’re about as valuable as cavalry. Besides, the attack won’t come from Russia, which is on its way to demographic, economic, and political collapse anyway. Or from China. It’s clear to them they don’t need a military confrontation when it’s just a matter of time before they win through economics and demographics. The real military threat to the U.S. (and China, Russia, and all the other nation-states) is what’s evolving in Iraq and Afghanistan. On the one hand, these wars can be viewed as a continuation of the Crusades. The average Muslim takes his religion much more seriously than the average Christian. Maybe that’s just because Islam is a simpler religion. More likely though, it’s because Muslims are much poorer and generally more backward than the West; it might be said they’re still sociologically where the West was during the Middle Ages. Be that as it may, there are 1.3 billion of these folks, and they feel badly treated. Osama spelled out, clearly and publicly, the three reasons for the current jihad—of which the average American is totally ignorant. One, Western support of Israel. Two, the presence of Western troops in Islamic countries. Three, Western support of corrupt puppet governments throughout the Islamic world (almost all of them, but prominently including Egypt, Saudi Arabia, Pakistan, and Iraq). His views are factually correct. And the facts greatly antagonize hundreds of millions of poor Muslims, who subsequently feel they have a lot to gain, and almost nothing to lose, by fighting the infidel. But what’s the nature of this War Against Islam, which shows every sign of heating up in Iraq and Afghanistan and spreading catastrophically to Pakistan and Iran? And beyond. It’s not a war against another nation-state; those governments are pathetically incapable of fighting a real war. Their armies are now, and always have been, used exclusively for suppressing the population. Because they aren’t uniformed and organized into conventional units, and because they attack only small or soft targets, the mujahidin (“terrorists” to Boobus americanus ) look like the guerrillas we saw in the 20th century. But they’re not. They aren’t fighting a war of liberation. They don’t have a central command. And they’re not actually trying to overthrow a government. Stupidly, the US government is responding by using all kinds of impressive and very expensive hi-tech devices to kill small numbers of fighters. Which is not only non-productive, it’s totally counterproductive. Every fighter who’s killed (forget about innocent wedding parties) gives rise to ten more young, motivated fighters. And these people have the highest birthrates in the world. This isn’t like fighting the Vietnamese, where there was at least a leadership hierarchy. It’s not like fighting ants or bees, where if you kill the queen, you win. It’s more like killing cockroaches in your apartment, when they infest the entire building. Sidebar here. I’m not using the word stupid as a pejorative, or because I can’t find a thesaurus. Nor am I using it to denote a low IQ; some people in the US government have quite high IQs. I’m using it in either of two other senses. One: as the inability to predict the consequences of actions. Two: as an unwitting tendency towards self-destruction. Anyway, it’s stupid to focus on things like Osama’s Al-Qaeda. That organization was just a flag planted in the sand, to draw attention to the cause. The movement has long since metastasized, and there are now undoubtedly hundreds of informal little organizations, some of whom are friendly toward each other, some of whom are bitter rivals. But all of whom share a common goal. They all watch each other and learn from what the other does. It’s like the early days of the auto business, when there were hundreds of companies. They were all innovating as rapidly as they could and all watching each other in order to profit from each other’s advances. They didn’t particularly like each other and were in true competition, but they had the same goal, and everyone immediately applied advances in technology that anyone else made. Unstoppable. By comparison, the US is like GM today. It’s got a research lab that comes up with good stuff now and then, but at a huge cost. And whatever it does come up with is applied slowly, bureaucratically. It will be completely overwhelmed by what amounts to a military marketplace. Which is another point. The mujahidin buy all their technology off the shelf. They may be poor and superstitious, but they’re not stupid in the way they’re dealing with the US. We attack them with a million-dollar (hard cost only) missile; they counterattack with a $1,000 IED. We attack them with an airstrike, using hundreds of millions of dollars of aircraft; they counterattack with a suicide bomber, at about zero cost. The US takes out one of their leaders; they attack a city like Paris and create mass hysteria. In the near future, you’ll find these people carrying out mass and random assassinations. Blowing up power transformers. Cutting fiber-optic and electrical cables. Doing nasty things in the air-conditioning systems of high-rise buildings. Sit down and brainstorm for 15 minutes about what you’d do if you really wanted to punish The Great Satan. If you don’t scare yourself, then you don’t have much imagination. Their return on investment is almost infinite. That assures the US will go bankrupt on the path it’s currently on. They don’t need NSA supercomputers; all they need is a few laptops, cell phones, some stuff you can buy at Radio Shack, instructions on the Internet, and a few buddies who share a common goal. And none of this postulates nanotech devices, which will be created in thousands of garages in the years to come. A determined guerrilla war is almost impossible to win, as the French found in Algeria and the Americans found in Vietnam. The reason is that if you’re fighting guerrillas, you’re almost certainly fighting the average guy in a country—which means you’ve got to kill almost everybody to win. If you’re fighting a guerrilla war, be assured you’re an outsider, and you’re on the wrong side (even if you think you’re the good guy). An open-source guerrilla war (to use computer jargon) is a new thing and much worse from the nation-state’s point of view. For one thing, it’s truly impossible to win. That’s for the same reason the behemoth IBM had its lunch eaten first by Apple (founded by a couple of hippies in a garage), then the PC (with thousands of independents writing code, strictly on their own). It’s the nation-state fighting hundreds of what amount to phyles, whose main common denominator, at the moment, is that they’re all Islamic. But that’s going to change soon. What’s going to happen? The US is going to lose this undeclared war catastrophically. The defeat is going to occur, in part, because it’s going to accelerate the ongoing bankruptcy of the US. The US is also going to be soundly defeated on a strictly military level. A nation-state can no more win against phyles than tribes could win against kingdoms. And nanotechnology, which will give individuals the power that only armies once had, is just in its very beginnings. Incidentally, phyle warfare is going to spread way beyond the Muslim world. My guess is that will occur in at least two other circumstances: the unwinding of dysfunctional colonial structures in most Third World countries, and internal economic collapse in some advanced countries. You’re going to see this all over Africa and all over the parts of the world the Europeans colonized, creating artificial nation-states by drawing arbitrary lines on maps, with no regard for who was already living there. About 100 countries in the world have absolutely no business being countries to start with. Lots of little phyles are going to spring up, not to take over the collapsing governments of Africa (which are nothing but vehicles for theft anyway) but to facilitate their destruction and replace them by something local. Or nothing. The Europeans and Americans will call them “failed states”—an accurate description. But they’re too stupid to realize that a failed state is actually a good thing today—the next stage of what’s going to happen. Somalia provides an early indicator. Governments, with their hugely expensive capital ships, are completely incapable of preventing teenagers in dinghies from controlling a major sea lane. Worse, governments are preventing commercial ships from arming their crews so they can effectively engage the boarders. Governments are incapable of protecting merchants, only capable of preventing merchants from protecting themselves. Phyle warfare isn’t going to be restricted to Africa, the Islamic world, and the like. It will arrive in America. All kinds of groups—outlaw bikers, skinheads, religious right types, local sovereignty enthusiasts, young Hispanics, and groups of every kind—could easily form loose networks, as opposed to tight organizations, sharing little more than dissatisfaction with the status quo. The world has been evolving ever more rapidly as time goes by. The recent rise to legitimacy of so-called NGOs (non-governmental organizations) is another straw in the wind. I’ll bet the next change is going to be turbo-charged. And bigger than anything that we’ve seen, or read about, so far. The Greater Depression may just serve as a background for all this—just a sideshow in a much bigger circus. - Copper has rallied over 50% from the bear market lows. - But it looks toppy here for a number of reasons. - How copper, gold, equities and inflation are configured looks very like the 2000 market top. Copper (JJC) broke strongly to new 2017 highs in July. The collapse of the Trump trade and reflation themes didn't seem to concern buyers too much. Funds are holding a record net long position. And this is how price is responding. So far, so bullish. What could go wrong? Well actually lots could. As most know, copper is related to growth and inflation, and inflation looks like it has peaked for now, despite the Fed insisting the dip is 'transitory'. Sure, inflation could turn back up, or copper could just ignore it for a while, but looking back at similar situations suggests otherwise. Many analyst have compared the current stock market with the 1999-2000 bubble. Eventually they will be right, but one reason many analysts have been wrong and early is because they didn't look across a variety of markets. 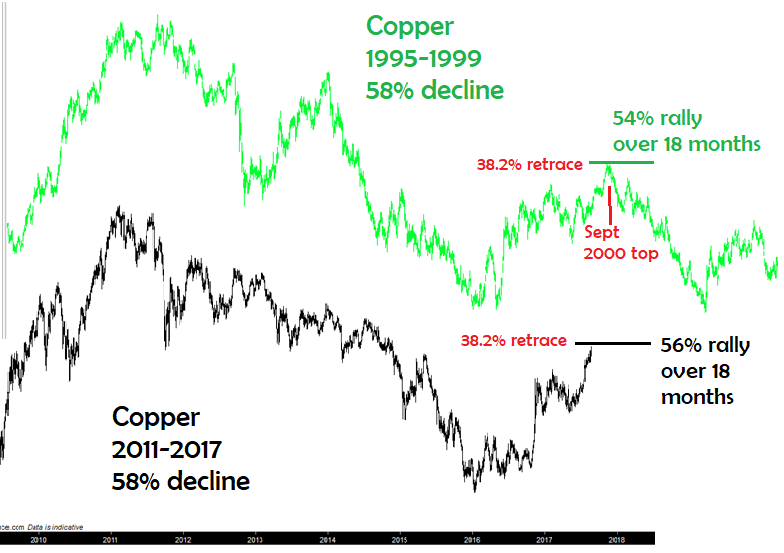 Copper bottomed in 1999 after a significant bear market and made a +50% recovery over the next 18 months into the September 2000 top. Equity bears in 2015 and 2016 would have saved themselves a lot of pain if they had waited for copper to do this again. And now it has. The reversal and pickup in inflation from 2015-2017 is comparable to 1998-2000 after it reversed a two-year downtrend. However, as the stock market peaked and crashed from 2000-2002, inflation reversed back down again. 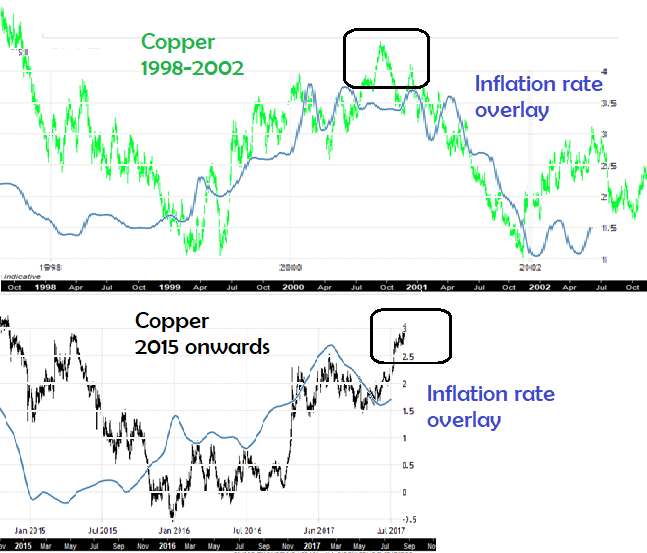 Superimposing the inflation rate on copper during both periods, we can see how similar the interactions are in both periods. Inflation had already peaked in March 2000 and was turning down as copper made its last rally into the September 2000 top. It may be doing the same now. The Fed raised four times in 2000 and we can say with hindsight they were much too aggressive. With three hikes in the past nine months and plans for balance sheet reduction, could we say the same of today's Fed with foresight? Other markets seem in a similar position to 2000. The equity comparison is well known, but gold also fits the period; the way it bottomed and rallied in 2015-2016 is comparable to 1999-2000. 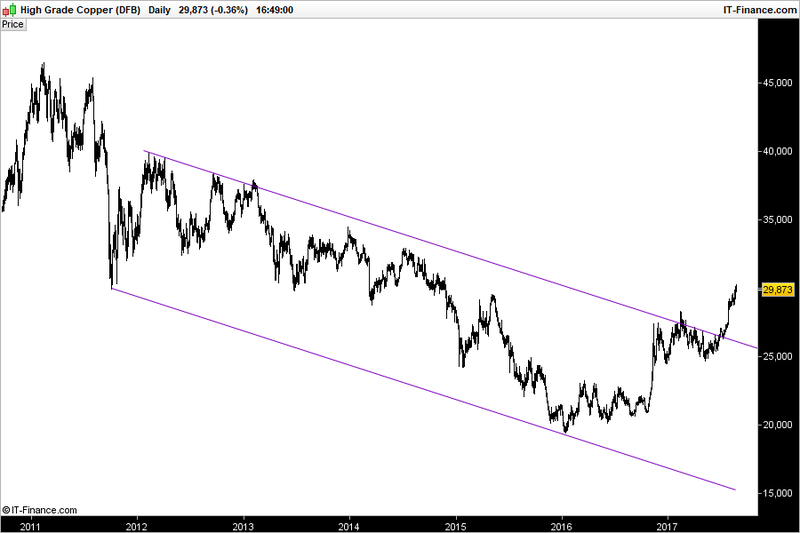 Over the medium term, I see it heading towards the lows again with copper. Many expect gold to shoot higher if equities fall, but history tells us otherwise. I use Elliott Wave to identify cycles of buying and selling in different markets. 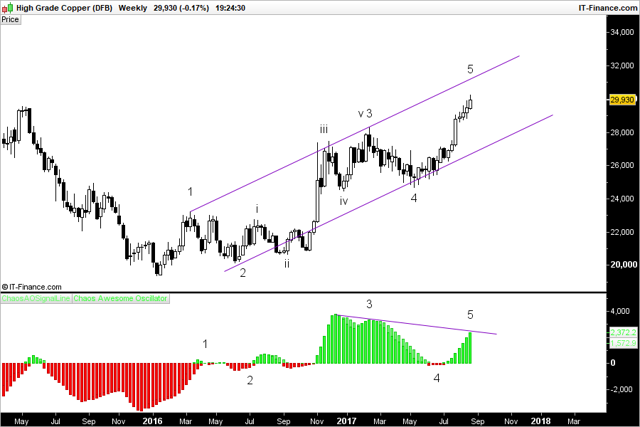 Copper looks to be in wave 5 - the last wave - of the current cycle from the lows. Wave 5 is associated with momentum divergence (which is evident in the lower pane of the chart), as well as deteriorating fundamentals (i.e. 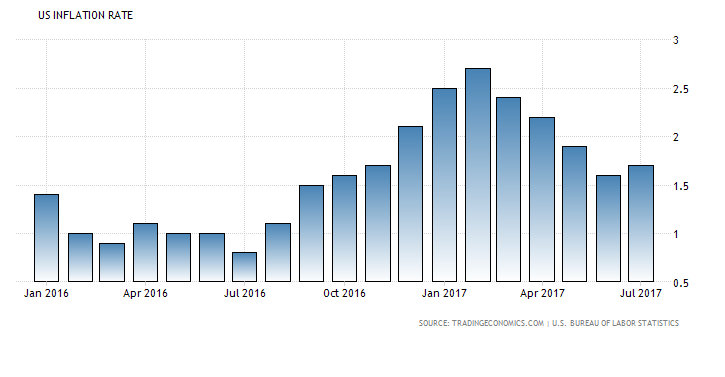 inflation falling). Sentiment is the real driver of price and we know from the very first chart how sentiment must be very frothy as positioning is so extreme on the long side. Once wave 5 is complete, a 61.8% Fibonacci retrace is normal, but I would target the November 2016 pre-election lows of $2.25 if equities start to fall significantly. I would expect copper to top out around $3.1, near the top of the channel. 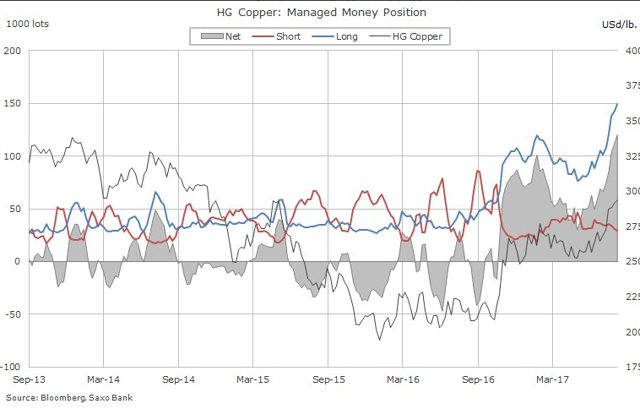 Copper has its own fundamentals based on supply and demand, but it is also a valuable piece in the cross-asset puzzle. 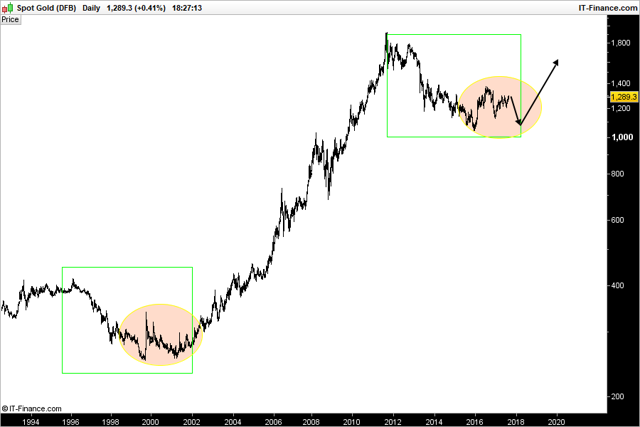 How copper, gold, equities and inflation are currently configured is very similar to the market top of 2000. This doesn't bode well for any market. Concentrating on copper alone, the technicals, sentiment, and positioning, plus the decoupling with inflation, suggest that we should be wary of the seemingly bullish move higher. Regardless of any historical comparisons, copper looks to be heading lower over the medium term. Job approval numbers for Japan’s Prime Minister Shinzo Abe are in freefall. Abe's support has now fallen below 30%, and his Liberal Democratic Party recently suffered heavy losses stemming from a slew of scandals revolving around illegal subsidies received by a close associate of his wife. But as we have seen back on this side of the hemisphere, the public’s interest in these political scandals can be easily overlooked if the underlying economic conditions are favorable. For instance, voters were apathetic when the House introduced impeachment proceedings at the end of 1998 against Bill Clinton for perjury and abuse of power. And Clinton’s perjury scandal was indefensible upon discovery of that infamous Blue Dress. The average citizen, then busily counting their chips from the dot-com casino, were disinterested in Clinton’s wrongdoings because the 1998 economy was booming. Clinton remained in office, and his Democratic party gained seats in the 1998 mid-term elections. Japan's National Debt is already over a quadrillion yen (250% of GDP). And the nation would never be able to service this debt if the BOJ didn’t own most of it. The sad truth is that the only viable alternative for Japanese Government Bonds (JGBs) is an explicit or implicit default. And, a default of the implicit variety has already occurred because the BOJ now owns most of the government debt—total assets held by the BOJ is around 93% of GDP; JGBs equal 70% of GDP. Japan is a paragon to prove that no nation can print, borrow and spend its way to prosperity. Abenomics delivered on all the deficit spending that Keynesians such as Paul Krugman espouse. But where is the growth? Japanese citizens are getting tired of Abenomics and there are some early indications that they may vote people in power that will force the BOJ into joining the rest of the developed world in the direction of normalizing monetary policy. Jordan Bitterman, CMO of IBM's The Weather Company, talks with Wharton's Catharine Hays about marketing in the realm of technology. Bitterman: Absolutely. I’ll give you a couple of statistics. These are things I did not know when I took this job, and they are data points that I have put in front of our clients and customers. We do roughly 25 billion forecast calls per day, and those originate from all sorts of data sources around the world. We do around two to 2.2 billion on an average day of location. Those 25 billion forecast calls are originating, pinging to and from two billion locations a day. It makes us one of the largest IOT platforms in the world. Bitterman: For instance, we do a lot of business with the airline industry, so the data sources need to come from not just Chicago, Illinois or Philadelphia. They need to come from towers and sensors and pings all over the place in order to be able to realistically have a chance at identifying whether they should put a plane in the air or if they should keep it on the ground. There are sensors inside of the planes. There are sensors throughout the United States. That is the Internet of Things at least in many ways…. When we get down to it, the real mission-critical, bread-and butter elements of IOT are what is sitting in elevators and airplanes and turbines. But now we’ve entered the cognitive era. What separates the tabulating era and the programming era from the cognitive era is that we can use structured and unstructured data. It’s not just zeroes and ones. We can lean into unstructured data like video or audio or faces, expressions. The idea that you and I could be sitting across a table from each other and I can read and react to your expressions based on whether you think I’m saying something smart or something kind of off. Computers can start to do that now, and that’s really what Watson is trying to do. It’s trying to learn, understand, reason and interact back. A definition of cognitive that I particularly like is: Programming is where people program computers, but cognitive is where computers program themselves. Certainly, with the aid of people, but they can start to program themselves, and that’s when things get super interesting. For our group specifically, we’re made up of a few different parts of the business. We’re made up of an IOT platform. I liken it a lot to the Romans and the aqueducts. There was water. We knew we needed water. We had to get water from one place to another because without it you couldn’t irrigate your fields, you couldn’t drink the water, you couldn’t make wine. Once you built the aqueducts, all of a sudden water was set free and could be used in so many places. That’s what we’re doing with the IOT platform as it relates to data. How can we take data and make it more useful? Certainly, there’s data that is useful all over the place right now; we’re not really stretching for data in this world. But there’s so much more data, like the data I’ve talked about before that come from elevators and airplanes, that we’re not using enough of yet. That IOT platform is charged with that. Bitterman: At IBM when we talk about AI, we don’t actually use the term artificial intelligence. We use the term augmented intelligence. It might sound like marketing spin, but words matter. When we think about augmented intelligence, we don’t think about any of the solutions that we have putting agencies or putting anyone out of business. We actually see it as benefitting them. If we go back to the programming era, computers didn’t put advertising agencies out of business. Computers spawned an entirely new way to do advertising, both to display advertising but also to go about creating media plans, etc. Bitterman: Yeah, it doesn’t have to be. You can type into it. But one of the really interesting aspects of cognitive technologies is that it does have natural language recognition skills, so a lot of the clients that we’ve worked with on Watson Ads have taken advantage of that API. Because why not, why wouldn’t you want to give people that option? Hays: Especially if you’re starting to cook. Your hands are dirty and you don’t want to type. Voice interface makes a ton of sense in many applications. But if you’re a bigger brand — Campbell’s, GlaxoSmithKline, Toyota and Unilever have all worked with us — they have higher risk thresholds because they are open to trying things and experimenting. I don’t mean to suggest that what we’re doing won’t work, but it certainly takes a leap of faith. It’s not the first thing on your plan. Just like me as a marketer, the first thing on my plan is the acquisition marketing. What is going to drive revenue or drive traffic to our consumer properties? I need to have bigger budgets and a bigger risk threshold to try to ride the crest of the wave and do something new and different and move into the future of advertising. The bigger clients understand that.